I challenge you to think of a better airtight storage container than a 5 gallon bucket. They are the perfect size for nearly anything that needs to be stored secure from oxygen and moisture. If a container is airtight, it’s also watertight. That’s a key factor because water is often more damaging than air. Too much moisture causes mold for instance, which ruins more than just food! I’ve seen a sleeping bag completely ruined by mold. Properly stored in an airtight 5 gallon bucket, that expensive sub 0 sleeping bag may still be usable today. If you’re concerned with airtightedness – it’s best to buy your buckets and lids at the same time from the same place so you can be assured they will work together seamlessly. And make sure they’re labeled food grade if you’ll be using them to store food. 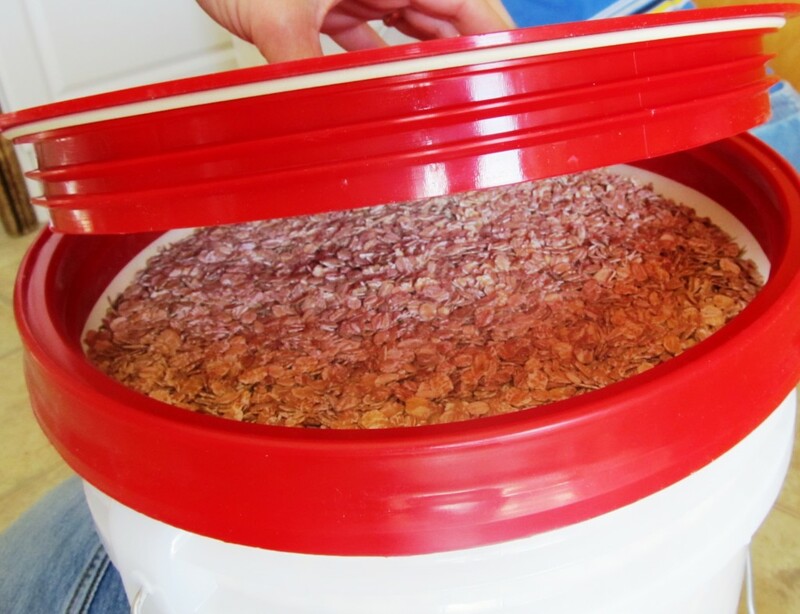 Here’s a great example of food grade buckets that come with their own airtight lids. 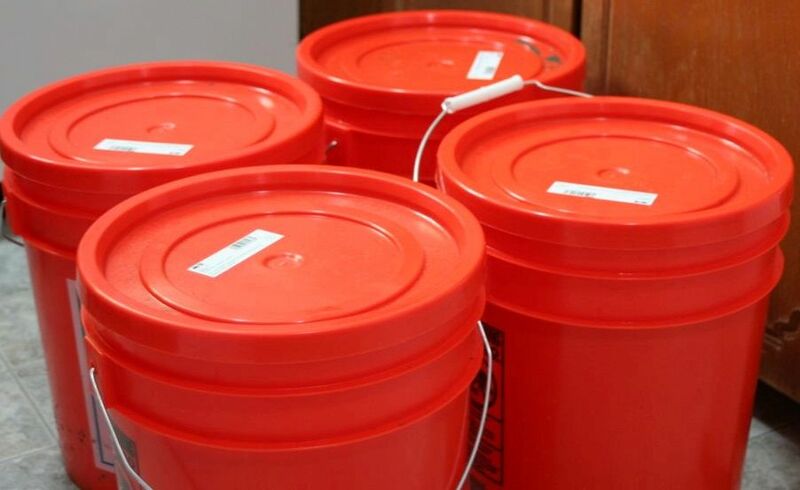 Your 5 gallon buckets can’t be truly airtight without a rubber sealed lid. The lids I use most are snap lids with a rubber gasket. You have to make sure you press them down hard all around the rim until you don’t hear any more clicks – that’s how you know you’ve made your bucket airtight. I lose my rubber seals frequently. So learn from my mistakes and always check to see if your seals are still in your lid before assuming that your bucket is airtight! Gamma Seal Lids: Also Airtight! A reader on our flood preparation with 5 gallon buckets guide helpfully informed me that rubber seal snap lids aren’t the only airtight lid for a 5 gallon bucket. Gamma Seal Lids work just as well. I wasn’t so sure about this because I didn’t think Gamma Lids had a rubber seal around the rim of the screwing part of the lid – but I was completely wrong! They’ve snuck a seal in right against the top of the screw-on portion which seals them up tight as long as you screw them on all the way. Airtight storage is important for food kept in the fridge, but unless you’re lucky enough to have a walk-in cooler you probably don’t have room in your food chiller for even one 5 gallon bucket. 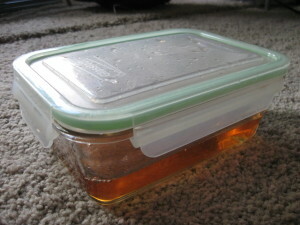 For leftovers, we use these glass containers with locking seal lids called Glass Lock containers. We have a really hard time now going back to flimsy plastic tupperware. 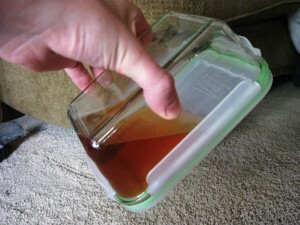 If you need airtight containers larger than 5 gallons you have to ask yourself – how airtight does this really need to be? Rubbermaid 18 gal totes are sort of airtight, but the lids don’t secure as well as 5 gallon bucket. They’ll keep a loaf of bread fresh but any pressure changes or moderate jouncing will break the seal. I haven’t really come across truly airtight storage containers larger than 5 gallons, but I can’t wait to be proven wrong! 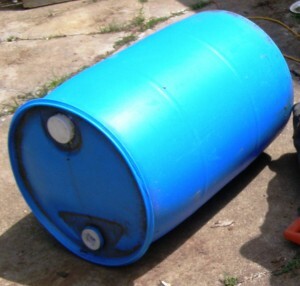 55 Gallon drums are certainly airtight – unless you cut the top off like we like to do – but they are really only good for storing liquids due to their relatively small spout. Even if you managed to stuff a bunch of your winter clothes into one of these, you can forget about ever getting them out again. You can easily double or triple your food’s shelf life if you can keep it airtight. Two big enemies of food stores are moisture and oxygen, and an airtight seal will keep both of them out for good. So you’ve got your airtight seal which keeps moisture and oxygen out – but what about the moisture and oxygen that you just trapped inside? Well that’s why moisture and oxygen absorbers are being used more and more to keep contents fresh. It’s sort of like getting the benefits of vacuum packing without actually having to vacuum pack anything. You’re probably already pretty familiar with moisture absorbers. 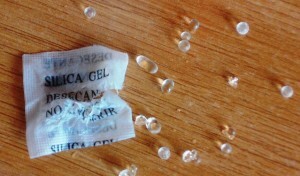 If you’ve ever found a packet of “silica gel” in amongst the packaging for shoes, electronics, or even dried meat – you’ve found yourself a moisture absorber. Might want to start hanging onto those, you can reuse them inside your airtight storage containers. I make my own low budget moisture absorbers by stapling fabric around some rice. I use just a paper towel if I don’t have fabric readily available. You can make these packs larger depending on the moisture level you’re dealing with inside your bucket. Oxygen absorbers aren’t so simple to make yourself. There’s some slightly more advanced chemistry going on here, so it may be better to just buy a pack of 100 which should last a pretty long time. Buckets are great! but they really dont store(full) very compactly, circles waste alot of space between them, not so bad if you pack them in octagonal clusters but still not as good as square buckets if you want to put 20 of them on a shelf or whatnot. You are missing a few things. There is another round airtight lid for round buckets besides the press down and Gamma lids. These are ratchet screw top pails. They have the rubber seal and are much cheaper than Gamma lids. They come in other sizes too. I like the two gallon size. But you must buy them with the type of buckets they fit on so you can’t just buy some to go on buckets you already own like you can with a Gamma. So if you get your buckets free or almost free these won’t help. Also there are 55 gallon open top drums available that have removable rubber sealed lids. Check with Uline.com. I was just at the bob’s red mill store in Oregon and they have food grade 6 gallon buckets and gamma seal lids too. GOOD PEOPLE.. DO YOU KNOW WHERE I CAN BUY 2-6 GALLON SCREWTOP CONTAINERS THAT ARE LIQUID-TIGHT AND CAN BE USED FOR SHAKE-WASHING CLOTHS.. THE IGLOO COOLER’S TOP LEAKS, AND USING GASKETS IS A HASSLE, ETC. 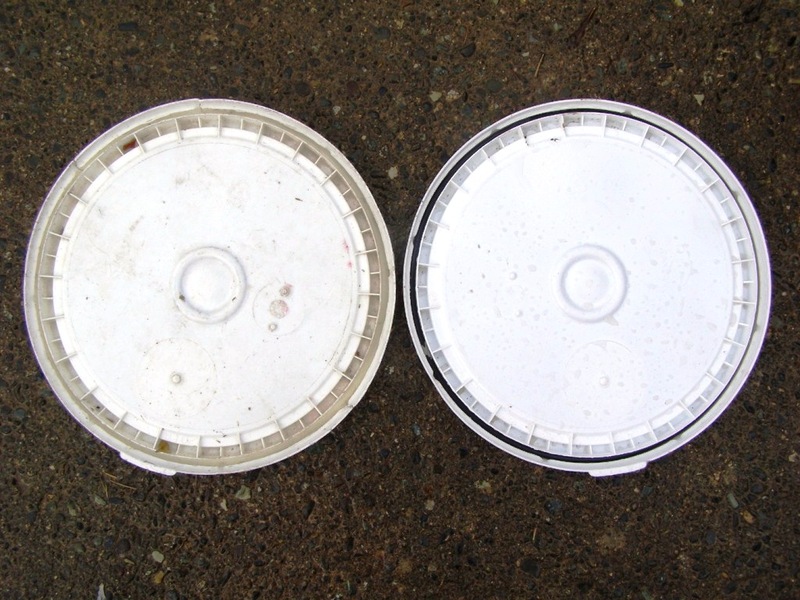 THE M&M PLASTICS SCREWTOP BUCKETS LID’S UNDERSIDES HAVE MANY ONE INCH LARGE MOLDED IN REINFORCEMENT PROJECTIONS THAT ABRADE CLOTHS. THE BEER BREWING BUBBLERS LIDS DON’T SEEM TO BE VERY SECURE. THE COUNTERTOP HAND CRANKED “WONDERWASHER” LEAKS AND CAN’T BE RETURNED, ETC. BUT SHAKE- WASHING CLOTHS IS OTHERWISE A GOOD ALTERNATIVE TO A MACHINE. I JUST NEED TO FIND LEAK PROOF CONTAINERS, WITH ABOUT 6 INCH OPENINGS. THANKS FRIENDS. Yeah these buckets are good but some say that over a few years air will pass through the bucket walls. You can open them every few years and add more oxygen and moisture absorbers. You can get open top food grade drums rather than the two bung barrel that is pictured. Lid has a gasket and top is screw top or held on with a ring. Only issue is how to vacuum the air out but they are liquid proof. Do you have any recommendations for hot packing liquid foods into a 5 gallon sealed foodgrade container and rapidly cooling the bucket below 41 degrees F while maintaining the seal? I am attempting to wholesale bulk soups without the added expanse of getting a bag-sealer/tumble chiller or modified atmospheric packaging system that I don’t have the space for. I’ve tested this process with an ice bath on a 2-gallon system and achieved a 50+ day shelf life, but worry about the size being prohibitive on a 5-gallon set up. Thanks for any insight you may have.